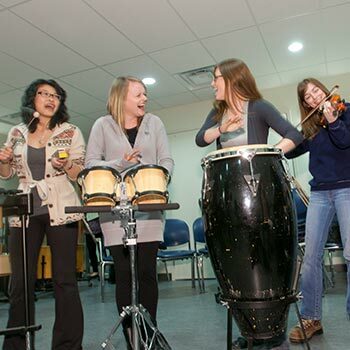 Our Master of Music Therapy (MMT) program is the longest-running graduate music therapy program in Canada. We have the only clinical improvisation lab in Canada, established in 2013 for improvisation and low frequency sound research. The clinic is funded through the Manfred and Penny Conrad Institute for Music Therapy Research (CIMTR), also housed at Laurier. The philosophy of our program is music-centred psychotherapy. Clinical musicianship and psychotherapeutic techniques are developed through clinical, theoretical and experiential practices. The CIMTR can offer you training in the Helen Bonny Method of Guided Imagery and Music (minimum enrolment). In our program, you’ll have the option of doing an original research study or clinical case study. We offer supervision expertise in clinical, arts-based and music medicine research. You’ll also take experiential courses in the safe and effective use of self, required by the College of Registered Psychotherapists of Ontario. Our MMT program is offered as a full-time, one-year (three terms) program for those with a Bachelor of Music Therapy, or as a two-year (six terms) program for those with a Bachelor of Music degree (honours), or other applicable honours degree (e.g. Psychology). Practicum courses are linked with classroom courses so that you can make connections between music psychotherapy theories and practices. In the practicum courses, you’ll be able to work with a variety of client populations. In our two-year program, you’ll complete two practica in your first year and a one-day-per-week practicum for two terms in your second year. For your first practicum, you’ll work with another student and two clients at Laurier’s onsite clinic. You’ll also partake in group sessions in off-campus community settings. At the end of your first year, a full-time summer placement will give you additional clinical experience. In your second year, you’ll work in an off-campus facility. In our one-year program, you’ll complete a one-day-a-week practicum for two terms, where you’ll work in an off-campus facility. Teaching assistantships and research assistantships are available. Major award holders (OGS, QEII and Tri-Council) are eligible for a $1,000 Incentive Scholarship. A completed four-year (honours) undergraduate degree in Music Therapy (for our one-year program), or a completed degree in music or related field such as psychology (for our two-year program). A minimum B average in your final year of academic study. Evidence of advanced clinical experience (one-year program only). Piano performance abilities at a minimum Royal Conservatory of Music (RCM) Grade 6 (if piano is not your primary instrument). Ability to improvise on your primary instrument. Successful completion of the following prerequisite psychology courses: Introduction, Developmental (Child, Adolescent or Adult) and Abnormal Psychology. Qualified applicants will be asked to do an audition and interview.